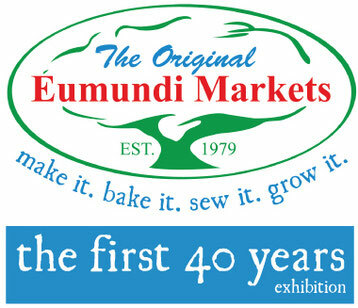 Discover Eumundi is celebrating the history of what is now known as the Original Eumundi Markets, which started on Saturday 24 March 1979 with an exhibition in it's Wan'din'in arts space. This exhibition opened on Saturday 23 March at 2pm and continues until Saturday 1 June and includes many of the photos, objects and documents that Discover Eumundi holds in it's heritage collection. Wan'din'in and Discover Eumundi are open Monday to Friday 10am to 3pm and Saturday 10am to 2pm. Discover Eumundi wants to grow this collection about the markets and is looking for people to help. See below for further details on how you may be able to help make our exhibition a great success. We are on the hunt for people's market memories both early days and recent. What do you love about the market and why? In leaving your memories you are allowing Discover Eumundi to use them and also keep them in it's heritage collection on the Eumundi Markets. If you wish to remain anonymous do not include your name or contact details. Do you have a treasured item that you have bought from the markets? It could be new or old. Please share a photo of it with us and tell us why you love it. Email to info@discovereumundi.com. Your photo and thoughts will become part of the heritage collection at Discover Eumundi. If you have any objects bought at the market that you would like to loan for the exhibition please contact us on the above email or phone 07 5442 87672. Shelley Bennett's wind spiral stall 1991. Do you have one of these? On 24 March 1979 three people gamely set up their stalls around Eumundi's CWA hall with refreshments served inside. There was a grand total of 8 visitors - not including the stallholders family members - and a tunover of $30. The Eumundi Markets was up and running! After only 1 year the markets gained a reputation as a source of energy, variety, freshness and friendliness, properties that still are present today but with an annual visitation that has grown to around 1.2miliion!